Use glitter glue to add bow ties, buttons and a tie (see photo), set aside to dry. 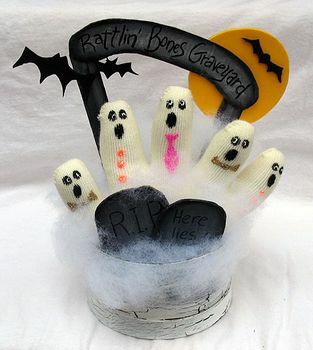 Using the printable pattern, cut the graveyard sign and 2 tombstones from cardboard. Paint all of them gray and set aside to dry. Use black marker to write RIP and “Here lies a” on the tombstones (you will not see more than that once craft is complete). Shade the craft sticks, sign and the headstones with black paint, highlight with a little white. Write the words “Rattlin’ Bones Graveyard” across the sign with black marker. Place some batting in front of the ghosts, but don’t glue it in just yet. Position the headstones where you want them, then glue them in, adding and gluing batting as you go.